Well, I couldn’t give up on the painted wine bottles DIYs. 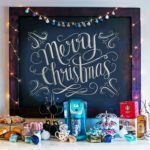 I loved this idea for Christmas with the naughty and nice theme. 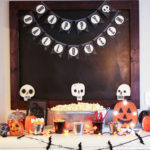 Its a great little decoration and it looks great on the bar for holiday parties! Please read ahead for instructions on how to create your own. Soak wine bottle in hot water and Dawn dish soap over night to lift off the glue and label. Allow your bottle to completely dry. Paint the entire bottle with your Shimmering Pearl Gallery Glass Window Color. This gives it that frosty look. 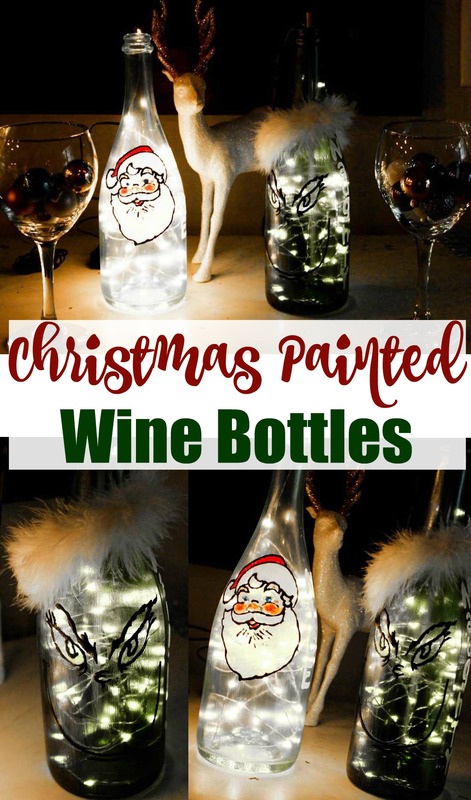 While you are allowing your bottle to dry start on your Christmas Grinch. Tape your Grinch template on the back of the Gallery Glass Plastic Sheet. Start tracing the outline of Grinch with your Gallery Glass Simulating Liquid Leading. Shake the Gallery Glass Leading vigorously before you use it and do a few practice lines to get a feel of the thickness and pressure you will need to apply to the bottle. Allow leading to fully dry. 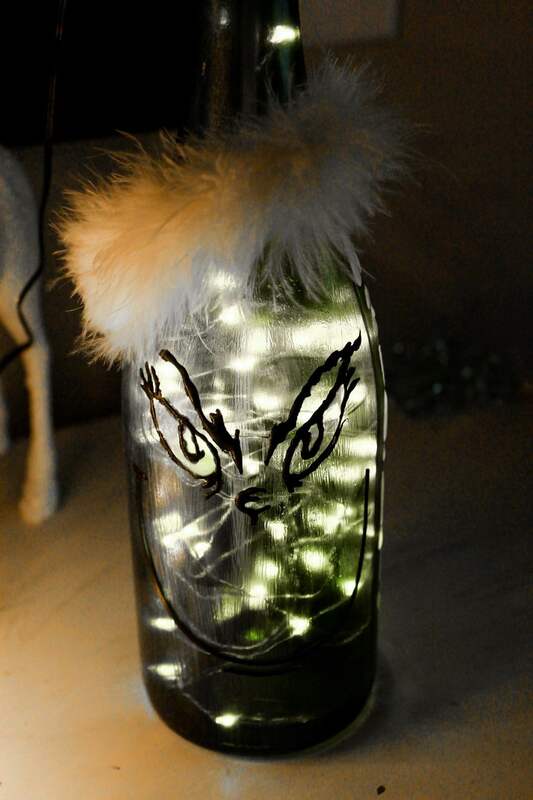 Use your Sunny Yellow Gallery Glass to color in the Grinch’s eye and allow that to dry. 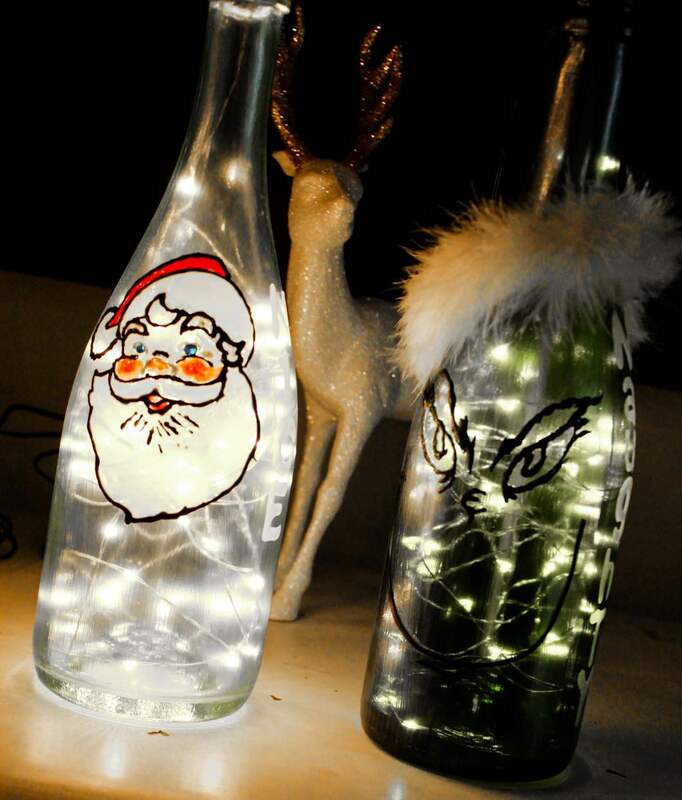 Peel Mr Grinch off your Gallery Glass Plastic Sheet with a razor blade and apply to the green wine bottle. 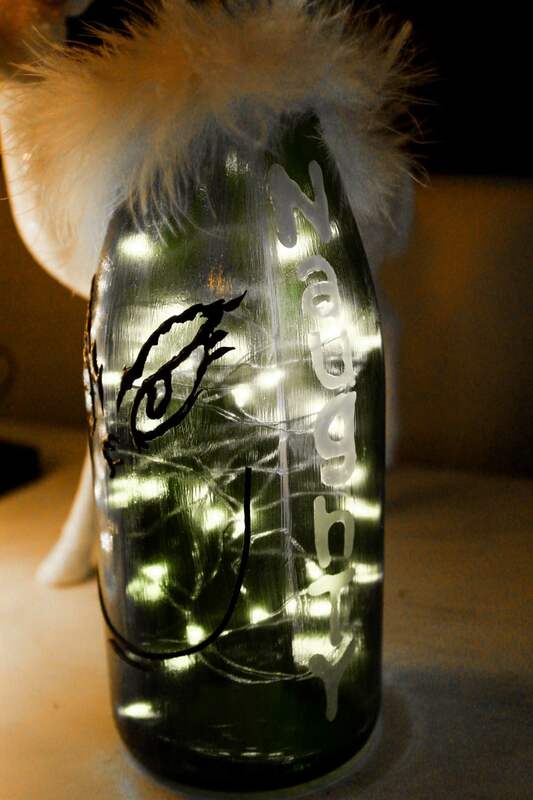 Insert your colored rice lights inside the bottle. To make the naughty letters, I used stencil with a pencil on a white sheet of paper and traced those letters with the Snow White Gallery Glass Color. Once those were fully dry I placed them on the side of that Naughty Grinch! Soak wine bottle in hot water and Dawn Dish Soap to over night to lift off the glue and label. It needs to be good and dry before you apply the paint to the bottle. Paint the entire bottle with your Shimmering Pearl Gallery Glass Window Color. 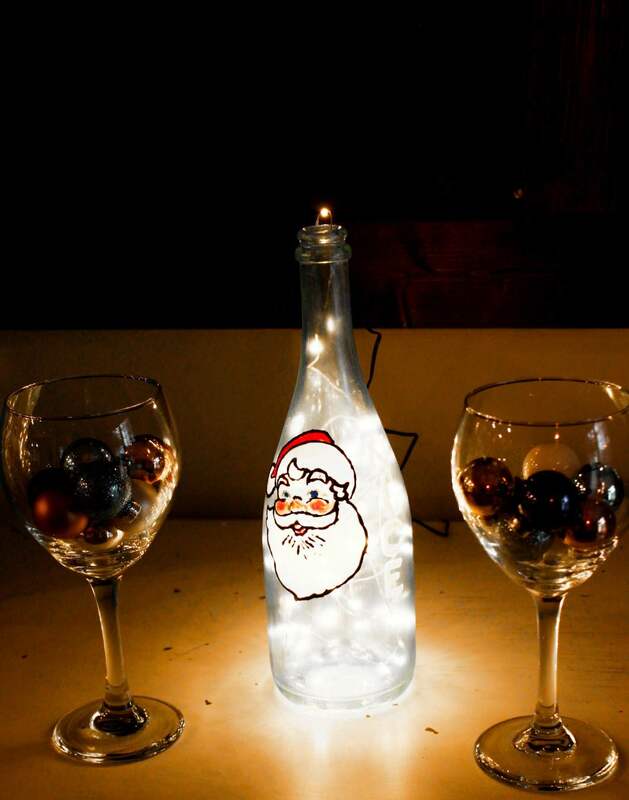 While your bottle is drying start working on good old St Nick. 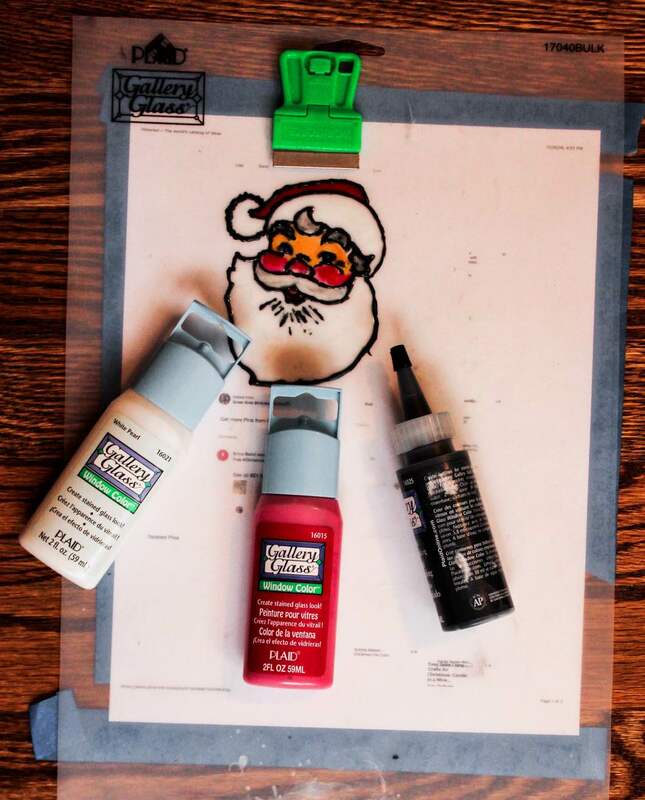 Tape your Santa template on the back of your Gallery Glass Plastic Sheet. Shake Gallery Glass Leading vigorously before use. Again, practice with a few straight lines to get the feel of pressure you need to apply. Outline your Santa with the Leading and let dry a good 10 – 12 hours. Now you can use your Frost Sand Gallery Glass Color for Santa’s face, Ruby Red for the hat and snow white for his beard and hat. Always start from the inside out when using liquid paints and again I always squeeze the paint onto paper towels or cardboard just to get used to the consistency. Stencil the word nice on a white sheet of paper with a pencil. 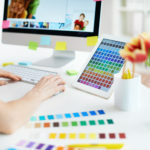 Tape to your plastic sheet and trace with Snow White Gallery Glass Color. Allow to dry 10 – 12 hours and apply to glass. Love these!!! Totally making them!!! 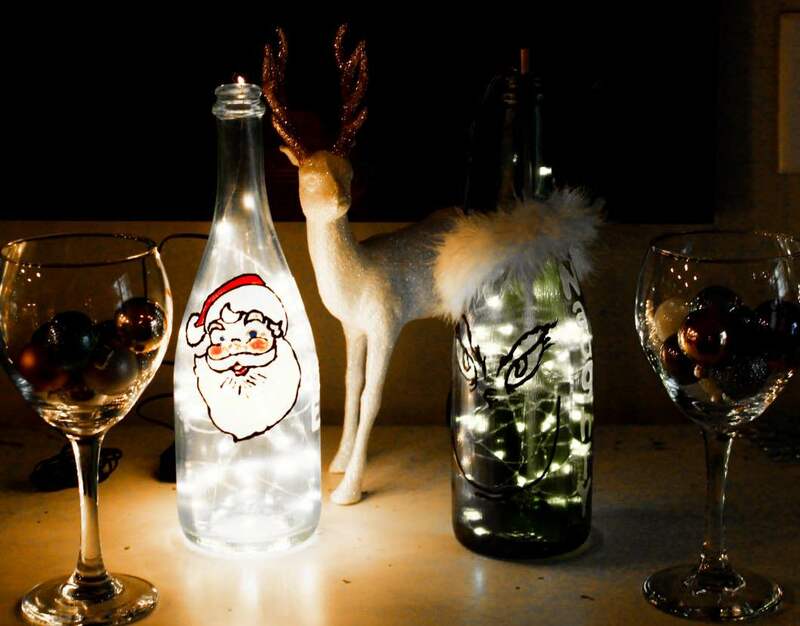 These Christmas wine bottles are just amazing! 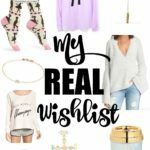 I love the Grinch ones especially.